Bees are an important part of our ecosystem. They produce honey, contribute to natural biodiversity, and pollinate important food crops that feed people across the globe. Without bees, our environment — and our dinner plate — would be a lot less colorful. After all, bees pollinate the vast majority of the 100 or so crops that make up 90 percent of the world’s food supply. Unfortunately, a future without bees could become reality. Honey bees have been dying off in record numbers and native species are disappearing as natural habitats dwindle. In order to protect the world’s bees, there are a few things everyone should to do help bees in their own lives. Lawns may look nice, but they require a lot of maintenance and aren’t all that great for the environment. Not only do traditional lawns use a lot of water, they also eliminate habitat for native animal and insect species. Instead of spending every Saturday mowing the grass, swap your lawn for a diverse native garden. When you kill your grass and replace it with trees, grasses, shrubs, and perennial plants adapted to your environment, you’ll slash your water usage and lawn maintenance while attracting beneficial bees, birds, butterflies, and other beneficial wildlife. If you’re not up for letting your yard go wild, you can still make your lawncare more bee-friendly by letting weeds grow and flower instead of applying herbicides. Common weeds like dandelion and clover provide food for bees while adding a pop of color to your yard. Insecticides don’t just kill unwanted pests; they harm beneficial insects like bees and butterflies as well. Make sure your home is bee-friendly by forgoing pesticides around the house and garden. To control nuisance bugs, opt for environmentally-friendly pest prevention strategies like crop rotation, physical barriers, and hand-picking of bugs and diseased plants. This spring, skip the pansies and tulips and opt instead for a colorful, diverse wildflower garden. It’s easier for bees to access nectar in simple wildflowers than in ornate cultivated blooms, and selecting native plants means you can have flowers in bloom across seasons. Wildflowers also need less care than cultivated flowers, as they’re naturally adapted to thrive in your environment. This means that a pollinator garden is the perfect project for the inexperienced gardener. To get started, research plants that are native to your area. Select different species so there are plants flowering in spring, summer, and fall. Choose an area of your yard that receives full sun, prepare the soil, and sow your seeds according to the directions on the packet. While wildflowers can survive on natural rainfall, you may need to water as they get established. Bees need more than food — they need water, too! Encourage bees to stick around by providing a water source in your garden. A water feature for pollinators can be as simple as a small basin of water or as ornate as a trickling fountain. Buying locally-sourced honey supports local beekeepers, ensuring the longevity of bee populations in communities around the country. Local honey is also more nutritious than generic store-bought honey, which may be diluted with cheap sugar, ultrafiltered to remove pollen, or even tainted with antibiotics. A number of pesticides used in fruit and vegetable agriculture have been implicated in colony collapse disorder. You can let the agricultural industry know you don’t approve of harmful chemicals by spending your dollars on food grown without pesticides. If you’re up for the challenge, a great way to help bees is to become a beekeeper. 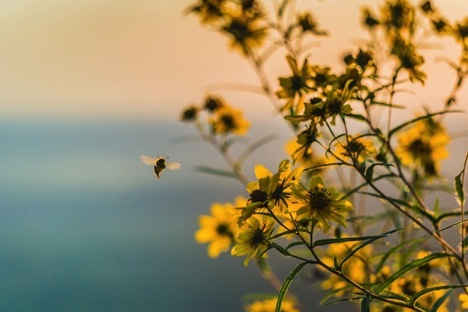 When you help a bee colony flourish in your own backyard, you’ll be making an immediate first-hand contribution to the bee population and your local eco-system. In addition to the environmental benefits that come with beekeeping, it is also a surprisingly relaxing hobby with great mental health benefits (Just avoid those stingers!). Getting started isn’t difficult. HomeAdvisor.com offers a great rundown of the tools and equipment you’ll need to be successful. However, just because a product is certified organic doesn’t mean that it’s pesticide free. There are a number of pesticides approved for organic use, and organic farmers can even apply conventional pesticides when other methods have proven ineffective. The surest way to know you’re buying pesticide-free is to purchase directly from local farmers. When you buy fruits and vegetables at a farmers market or through a CSA, you can learn about a farmer’s growing practices straight from the source.